In our modern lives, it often seems like the produce can’t keep up with our schedules (much less our brains). At least that’s the way it is in our fridge. I made this crustless quiche because most of the ingredients were about to go bad and have to thrown out. 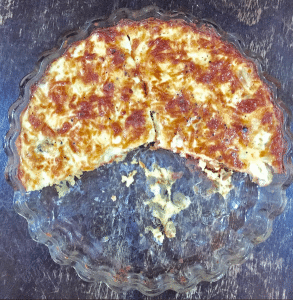 I absolutely hate wasting good produce so the result was this delicious quiche that we had for breakfast. With a pie this large, there are sure to be leftovers. Or what I call lunch tomorrow. Saute the garlic in a teaspoon of oil until fragrant. Add sliced veggies until limp. Then add until spinach is wilted. Add oil as needed/desired. Whisk eggs, then milk in separate bowl. Grease your pie plate or cooking vessel. Fill bottom layer with veggie and spinach saute. Spread feta throughout. Spread feta throughout. Pour milk and egg mixture on top. Garnish with mozzerella and other cheese. Bake at 350 until eggs are cooked, usually 35 minutes, longer if needed.